Facebook's Paper app has a terrible name. Flavor, Headlines, and Pride are just three of the many sections of Paper, which aggregates content by subject or interest. 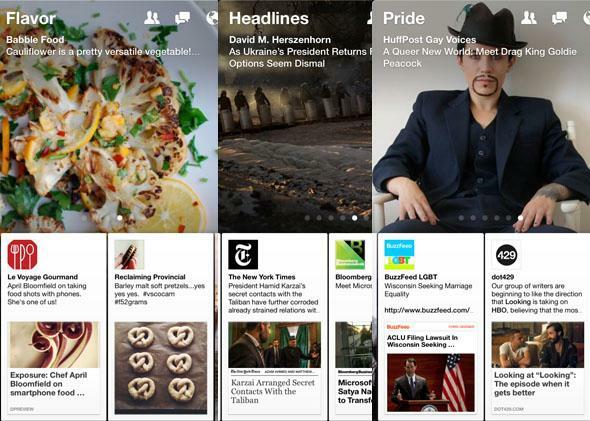 Last week Facebook announced a new app called “Paper,” and Monday it went live in the App Store. (It’s iOS-only for now.) The app displays a combination of Facebook newsfeed data and content aggregated from around the Internet, divided into categories like current events, tech news, or “LOL.” So far the general consensus seems to be that the app is beautifully designed and has the potential to completely eclipse the Facebook app. Paper will need additional functionality and additional development, but it can get there, and probably will. I agree with all of this. The more I use Paper, the more I like it. It may not become my main mobile squeeze right away, but I could see it taking over from the Facebook app eventually. I have some reservations about whether I will want to get my news from this thing, but yeah, in general it looks great. I just have one problem with Paper, and it’s getting in the way of my ability to enjoy the new app: “Paper” is an absolutely abysmal name. Paper was mankind’s first widespread information storage technology, and it seems that Facebook wants to be the aggregator of everything, to be synonymous with the Internet. So, through the name “Paper,” Facebook is invoking a universal and attempting to attach itself to a powerful and enduring concept. But that’s a really weak and unimaginative strategy for taking over the world. Facebook is a good name because it took a concept that was known—but not very widespread—in the physical world and translated it to something digital. It’s also a good name because it’s pretty self-evident, even if you didn’t go to an Ivy League college that handed out facebooks. That’s all I’m asking for here. It’s tough to name a product, and choosing a name that has known analogs isn’t a bad thing. Sometimes a company, like Box, can even pick a name that’s so on the nose it’s refreshing. And I think “Slate” is an example of a name taken from a word that has relevant meaning without too much emotional baggage, though perhaps I’m biased. But 10 years in, Facebook is well-established. It’s not a small company with a big dream anymore. It’s just huge. At this point, every time the company does something new it should be an attempt at an innovative step forward. And Paper is a nice stab at something fresh, except that the name is burdened with heavy nostalgia and all of the associations we have with paper, like “shuffling papers,” “pushing paper,” or even getting a paper cut. The name conjures grave associations instead of the nimble and unencumbered feeling that comes from actually using the app. In the runup to Apple’s iOS 7 release, people started talking a lot about flat design and about how the new operating system was finally going to eschew skeumorphism. It was time to get rid of the leather-stitched, Wild West look. And that’s what should have happened with Paper. Facebook should have chosen a name that indicated progress forward. There was no reason to give a shout out to thousands of years of tech history. Humans aren’t always “ready” when major innovations appear, but we certainly know who we are. And we certainly know what paper is. Facebook should have left that name to the drawing and painting app by FiftyThree and shown us that we’re going somewhere new and it’s gonna be great.